The Moroccan Government has launched the strategic plan “Digital Morocco 2010” in October 2009. Its main objective is to provide integrated, transparent, and efficient e-government services which meet the expectations and the needs of the business sector and the population at large. However, we unfortunately ended up with different government entities offering several separate and independent e-government services which don’t meet the main strategic objectives, especially the “user-oriented e-services” goal. An efficient way to solve this problem would be to develop and adopt a common knowledge-based model and a framework for services modeling. In this context, information technology, particularly semantic technology plays a fundamental role in any e-government services development. Indeed, semantic technologies, such as ontologies and semantic web services, enable enriching e-government services description with additional semantic information, which allows an automatic processing of information and services and communication between involved parties. 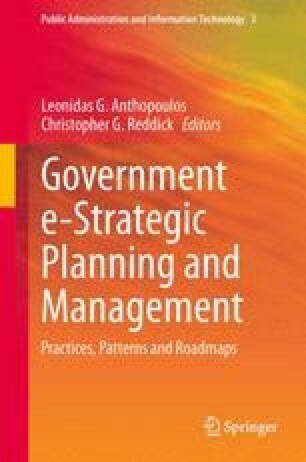 Therefore, the underlying research question of this chapter is: “what are the appropriate methods, frameworks, and models that can help in the development of integrated, transparent, and efficient e-government services?” In this chapter, we will first explore and analyze some semantic web service formalisms as well as a set of available metadata, standards, and referenced models developed by other e-government researches and projects; then, we will present our modeling framework for e-government services and its e-Customs implementation through the “Customs Clearance of Goods” case study. Digital Morocco (2010). Public deliverable of the National Strategy for Information Society and Digital Economy 2009–2013. Available at: http://www.egov.ma/SiteCollectionDocuments/Morocco%20Digital.pdf. Sowa, J.F. (1992). Conceptual graphs for representing conceptual structures [Online]. Available: http://www.jfsowa.com/pubs/cg4cs.pdf. UN E-Government Surveys (2012). UN e-Government surveys 2012. Retrieved from http://unpan3.un.org/egovkb/global_reports/12report.htm. World Customs Organization: WCO. (2012). Nomenclature and classification of goods. Retrieved from http://www.wcoomd.org/en/topics/nomenclature.aspx.